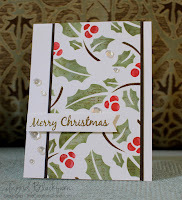 After the almighty struggle with the Muse card last week, this one for Muse Christmas Visions sort of made itself and I think I have incorporated most of the same elements that our very, very talented Guest Designer Ingrid Blackburn has used !! .Now I really like a simple panel in the middle -as you know! :) - but this time it seemed to lack something .So found a scrap of dotty embossed card (thanks Michele for reminding me about using my embossing folders! ) and mounted it on that.... And totally different from my usual style but think I actually like it ! Think this would also qualify for the CAS on Sunday challenge as they are asking for polka dots as their theme. Oh, Jenni ... I believe this is a winner ... such a perfect take on the muse. Lovely! I forgot about wheels - you've put this one to good use! So glad you joined us at MCV this week! You can never go wrong with Swiss Dots, Jenni - this gorgeous card uses all the right elements to make a totally inspired version of Ingrid's card ... totally brilliant! WWCD! I agree...this is a winner! Absolutely perfect and I love it! Beautiful card, Jenni! Love the holly/text panel.